Hampton Inn Orlando-Maingate South hotel of Davenport Florida is South of Walt Disney World and located at I-4 /Exit 55/ and Hwy. 27. Davenport/Orlando Florida area attractions include golf courses Walt Disney World EPCOT Magic Kingdom Fantasy of Flight museum botanical gardens and Universal Studios. Within 0.25 mile you can dine at Cracker Barrel Beef O Brady Perkin*s Bob Evans and many more. 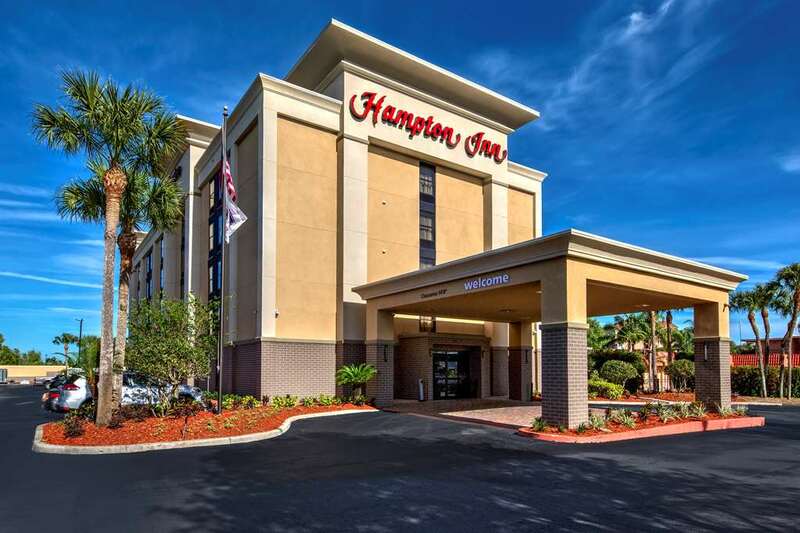 Our Hampton Inn Orlando-Maingate South hotel features 83 hotel rooms interior corridors with a small meeting room seasonally heated hotel pool and spa voicemail and exercise room. Our King Study hotel rooms includes 1 King bed with a Sleeper Sofa Micro-Fridge Desk Executive Chair. Other hotel amenities you will find at our Hampton Inn Orlando-Maingate South hotel in the Davenport/Orlando Florida area include wireless high-speed internet access complimentary hot breakfast in-room coffeemaker and 27** TV with prime channels and Lodgenet pay-per-view service. We also offer connecting hotel rooms cribs hair dryers - irons. Refrigerator with microwave guest/laundromat and rollaway beds are available at our Hampton Inn Orlando-Maingate South hotel of Florida for a nominal fee. We love having you here at the Hampton Inn Orlando-Maingate South hotel in Florida. Perkins: Chinese cuisine served from menu or buffet style. Grand China Buffet: Chinese cuisine served from menu or buffet style.